Kenneth Williams kept a diary for more than forty years and in 1993, five years after his death, these diaries were published in an edited form. The diaries revealed a more complex figure than the comedian who became much loved through his Carry On roles and famous appearances on the chat show circuit. The private Kenneth Williams was a remarkably well read, religious man haunted by his homosexuality, his sometimes outrageous behaviour, and his thoughts of suicide. He lived an ascetic and often lonely life in a series of modest London flats and never seemed to have much money considering how famous he was. The diaries are 800 pages long (in my paperback copy) and include many interesting photographs from different points in Williams’ life, from his early revue days to the distinguished, grey haired figure of the late eighties shortly before his death. They reveal how unhappy he was at times and his personal thoughts on the rest of the Carry On team, plus everyone from Joe Orton to Noel Coward to Peter Cook to Tony Hancock and so on. Williams in general. ‘We went to the Odeon to see a film but a crowd of hooligans kept shouting “Hallo Kenny, you queer!” and more in this vein ’til I got up and asked “Who is making these remarks?” and there was silence. God! Why don’t people leave one alone?’Surprisingly, Williams never seemed to make a huge amount of money in his career and is always fretting about whether or not he could afford to retire. You look at far less talented entertainers like Graham Norton and Jonathan Ross raking it in today and reflect that Williams was born in the wrong era. In the diaries he’s always having to do little odds and ends right up to his death and seems to be a permanent fixture on the new fangled thing called Breakfast television in the eighties, doing a little ten minute newspaper slot or whatever for a modest cheque and a lift home. The young Williams begins the diaries with aspirations of becoming a serious stage actor and he is for a while. He ends up doing cabaret and radio comedy though and eventually settles into the Carry On series. The money is rubbish but it’s a regular cheque and Williams enjoys the company of some of the team, Hattie Jacques especially, who, we learn from the diaries, always invited everyone over for Christmas and was one of the nicest people ever. The insights from the sets of Carry Ons are fascinating for anyone who has grown up watching them on television. Williams seemed to absolutely hate Sid James – perhaps because James was like the leader of the Carry On team and was treated as such by the media – but loved Barbara Windsor and Kenneth Connor. He had a great distaste for Charles Hawtrey (a very colourful and rather drunken character in the diaries) but respected Bernard Bresslaw a great deal and so on. It’s really interesting to read who Williams likes and dislikes and why. Williams’ own view on the series is up and down but mostly down. ‘We’re not here to shoot poetry we’re here to shoot s***,’ says Carry On director Gerald Thomas to Williams at one point. ‘I bet you put that in your diary!’ There is a lot of Carry On material in the book that I think most people will find very interesting, like Williams vying with Barbara Windsor to chat up the same male extra on the set of Carry On Camping or him frequently taking the p*** out of a somewhat pompous Phil Silvers on the set of Carry On Follow That Camel. Take this entry from 1974 for example. Williams has ducked out of the Carry On London stage show but ends up watching a performance anyway. ‘George gave me dinner and took me to the Victoria Palace to see Carry On London. It was like watching human beings forced into a pig sty & forced to make light of their plight. The show is a pathetic rag-bag of end-of-pier and would-be Cochran type revue.’ Because he was intelligent and very well read I think Williams was ultimately frustrated by most of the work he did in his career, perhaps feeling he got out of the lift on the wrong floor at some point or other and had been trapped there ever since. There are of course countless famous figures that flit in and out of the book aside from the Carry On team. Tony Hancock, who gave Williams a big break and then sacked him when he became too popular, Kenneth Horne, the urbane radio comedian who was a father figure to Williams, the outrageous playwright Joe Orton, and Maggie Smith, Gordon Jackson and Stanley Baxter – who were all friends of Williams. I especially enjoyed the diary entries featuring Peter Cook. Cook always cracked Williams up and Williams reproduces many of Cook’s funny ramblings done purely for his benefit on the set of that awful Hound Of The Baskervilles spoof. There is also a wonderful bit for anyone who has read Writing Home by Alan Bennett. Williams visits Bennett’s house and notes later in his diary, with some distaste, that Bennett has some tramp woman living in a grubby caravan in his garden. This is of course Miss Shepherd from The Lady In The Van. I honestly don’t think Kenneth Williams would have put up with her the way that Bennett did! Williams claimed to be celibate in real life and it appears he was. In the diaries though we read about his fantasies and frequent holidays to Tangiers where he has some fumbling and fleeting gay experiences. ‘Went back to the Hotel. Met the owner. Heartened by the remark “All my boys are very clean and reliable” and we rolled around amorously. All our morality teaches us that you should never use another human being for base purposes because in the process you degrade each other. I long to be free of temptation.’ Asked what the appeal of Tangier is by a friendly customs officer, Williams replies that he enjoys the climate and then admits to his diary that he didn’t sound very convincing at all when he said that! I enjoyed the many diary entries that detail his holidays with his mother too as Williams is very caustic and amusing venting his spleen at invariably ending up on some cruise ship or something with a load of ordinary holidaymakers who, of course, all recognise him and generally get on his nerves. Another interesting thing about the diaries is of course reading Williams’ thoughts on events and politics through the years. ‘I’m utterly sick of the moon,’ he writes in July, 1969. ‘The papers never stop but nobody mentions it in conversation. Bertrand Russell said last week that the attempt to put someone on the moon was an act of impiety.’ Williams seems to become more right-wing as he gets older and always raises a glass to a Tory victory on election night. He also writes about any film he has watched or book he has read (often in detail) in the diary and this is good fun. It’s sort of compelling really to read his thoughts on things like Dirty Harry in his slightly overblown and distinctive manner! There are entire decades and countless personalities that I haven’t even mentioned in this review. It’s a huge book covering over forty years and one I find useful to have when you want something to dip in and out of. You can pick a year at random and see what Kenneth Williams was up to! 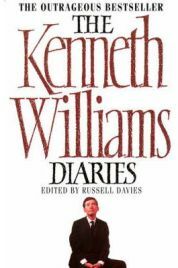 I found the The Kenneth Williams Diaries fascinating and highly entertaining at times and would certainly recommend the book. No Comments on "The Kenneth Williams Diaries"